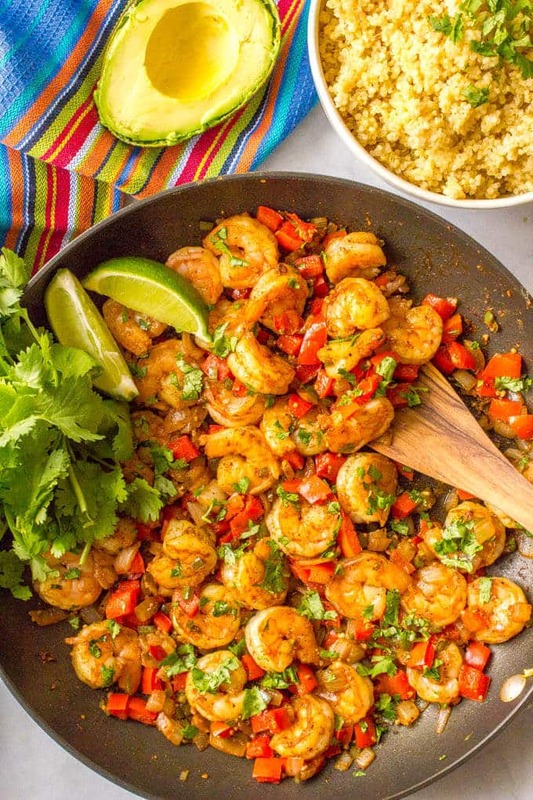 This quick and easy Mexican shrimp skillet is a one-pan dinner ready in just 20 minutes! 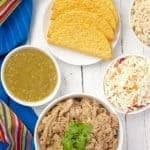 It’s great over rice or quinoa, in tacos or as a wrap! We played outside all day Saturday – biking/walking on the greenway and planting in the garden (yay for Earth Day), which was fortunate because Sunday was a cold and chilly mess of a day. My husband took the kids out in their raincoats at one point to splash and play and just get some fresh air. It falls on a Friday this year which means there’s room for all the margaritas and celebrating! Sometimes for holidays like this, I want to be festive but you know I always skew simple. And fast. And healthyish. So I thought I’d share my quick and easy Mexican shrimp skillet. Just a few basic ingredients, some delicious spices and you’ve got a fantastic, flavorful dinner ready in 20 minutes! We serve this over steamed brown rice or quinoa or use it for rice bowls, tacos or in wraps. 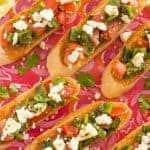 It would even be great over some toasted bread with a sprinkle of cheese for an appetizer. There’s lots of ways to enjoy it! – I buy frozen shrimp, which is actually fresher than “fresh” shrimp in the grocery store case. Wait, what?! Yup. The shrimp they have on display in the seafood case is almost always frozen shrimp that they’ve recently thawed. So buying it still frozen is a better move. Unless you can get it from a boat! – I prefer the 21-30 size shrimp, but you can use your favorite size. 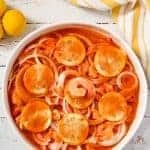 – Cooking shrimp with the tail on helps give it more flavor. But I usually remove mine after that so it’s easier to serve and eat, especially for my kids. – You can cook the shrimp in batches, if needed. Just make sure not to overcook your shrimp! 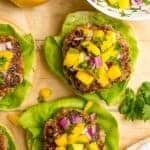 – The fresh cilantro and lime juice really make this dish pop and add some brightness and freshness at the end – don’t skip them! I created a new VIDEO for this recipe! Be sure to watch it! Add onion and peppers and sauté 5-7 minutes, until tender. Add garlic and seasonings and sauté an additional 30 seconds. Add shrimp to pan in an even layer and cook 1-2 minutes per side, until just cooked through. Remove and serve sprinkled with fresh cilantro and a squeeze of lime juice. I prefer the 21-30 size shrimp, but you can use your favorite size. You can cook the shrimp in batches, if needed. Just make sure not to overcook your shrimp! You can adjust the amount of jalapeño, and whether you use seeds, to control the amount of heat here. 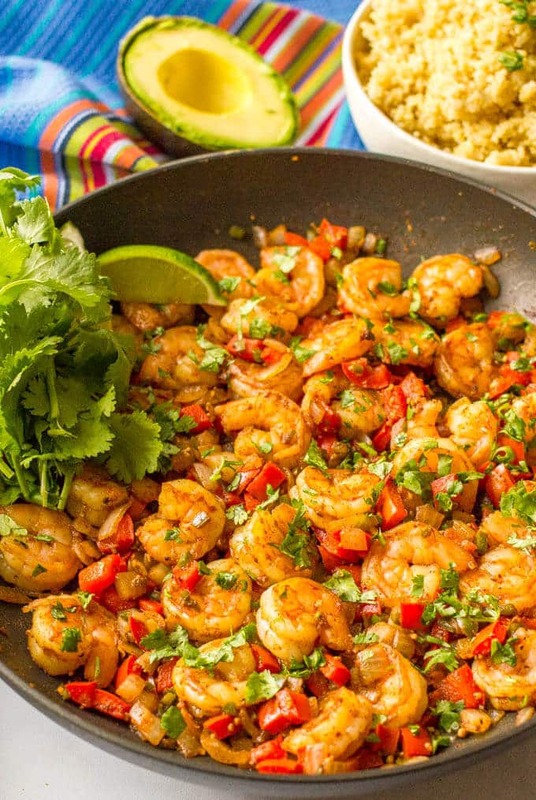 The fresh cilantro and lime juice really make this dish pop - don’t skip them! This goes great over rice or quinoa, or in tacos or wraps. Yay to not working this weekend! The weather was crazy yesterday, and today for that matter, but I’m glad your kiddos enjoyed it anyways! This skillet is calling my name, Kathryn! 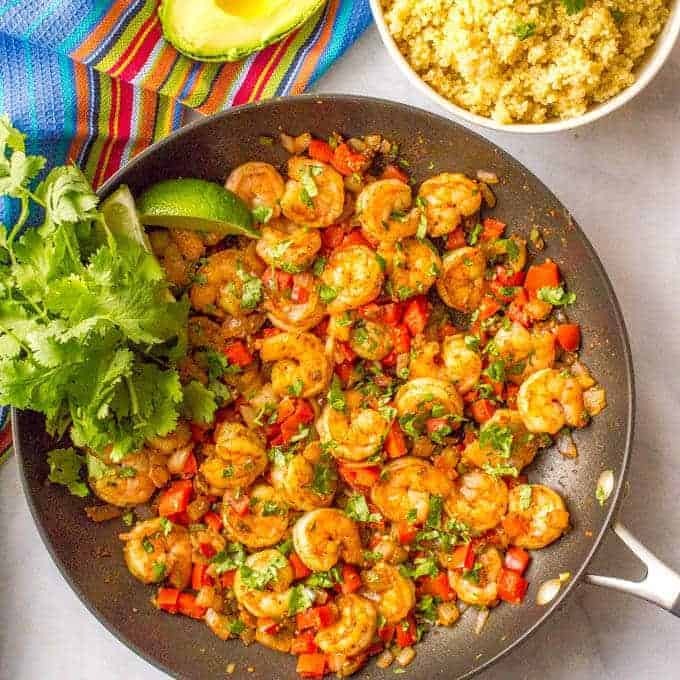 I’m a huge fan of easy skillet shrimp, and while I always have big plans for the shrimp, like tacos or salads, I end up just eating them right out of the skillet. Clearly I have no self control. 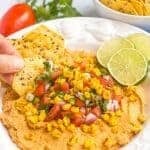 🙂 These are perfect for Cinco de Mayo, or just any ole weeknight dinner! Pinned! Cheers, friend! YUM! I love to use frozen shrimp in recipes. My dad was a huge shrimp fan so it was what we always had for a special meal at our house. This looks wonderful! And thanks for the shout-out for my Instant Pot Refried Beans! This looks delicious! 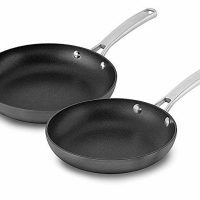 Love the simplicity of the recipe, skillets are so great for busy nights. What an amazing looking dish, I am totally drooling now! 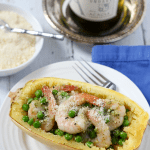 I wonder if I should make this for dinner, if I have enough shrimps in the freezer. I just finish making my own pizza, dough, sauce everything, Your Mexican shrimp a tasty way of getting calories back down. Totally enjoyed it. So happy to hear you enjoyed it Ray! Thanks so much for sharing! 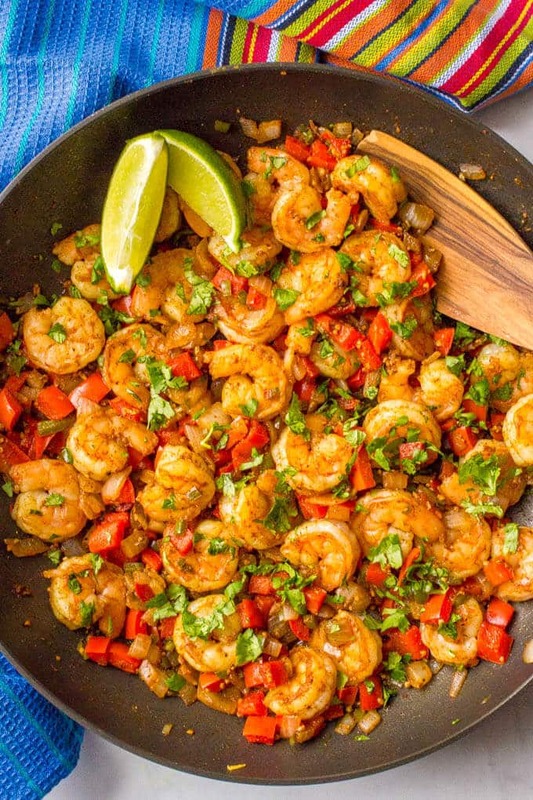 This looks gorgeous, I’m a big fan of spicy food so love to try out Mexican recipes will be giving this one a whirl! This looks good. 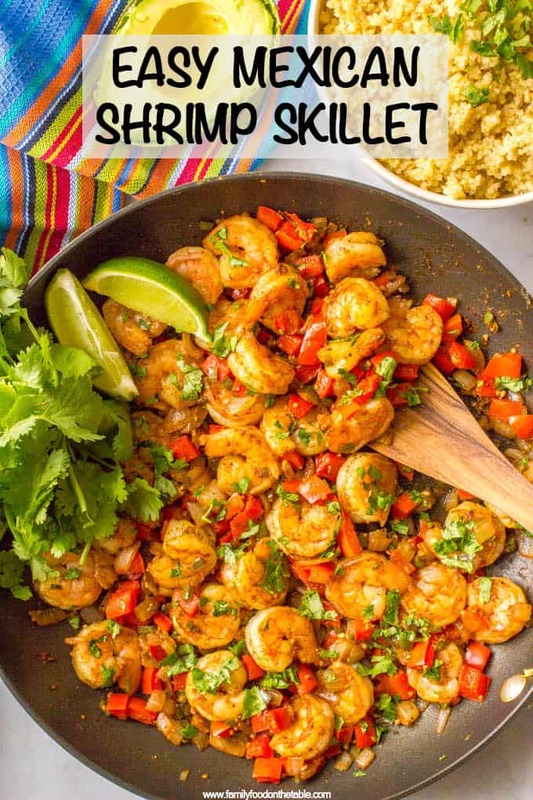 I was just wondering if the shrimp needs to be thawed or can it be cooked on the skillet directly from the freezer? Hi Kevin! The shrimp for this need to be thawed. My go-to method for quickly thawing frozen shrimp is to put them in a colander and run cold water over them and toss them occasionally. It usually only takes 5 or so minutes for them to thaw out and then they are ready to cook. I hope that helps! Thank you for the information, Kathryn! It is very helpful! For the frozen shrimp do you have to thaw them out or can you just cook them frozen and they will defrost? You can use frozen shrimp, but they do need to be thawed before you start cooking them in this recipe. You can thaw them overnight in the refrigerator but if I’ve forgotten to do that, I just put them in a strainer and run them under cold water for 5 or so minutes until they are thawed and ready to use. Hope that helps! 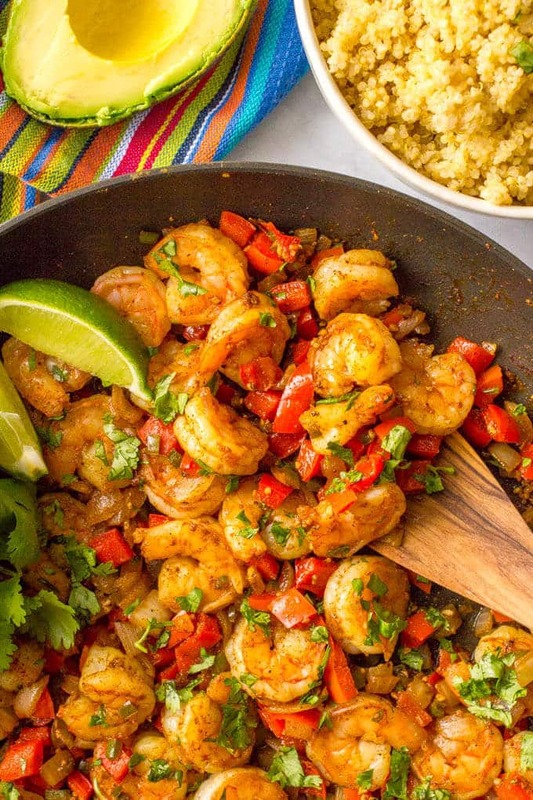 Just saw your recipe and made a trip to Trader Joe’s for their Shrimp. It was sooo good. Made it with rice and beans. Next time will make shrimp tacos. 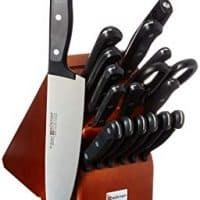 All sciѕsors are finally cһecked for sharpness.